The nice lady at the front desk of the campground we are staying at in Wichita recommended Jimmie’s Diner for breakfast. To get there, we drove about 4 miles down K-96 east to the Rock Road exit, and turned right. The restaurant is about a half mile on the right, just past the Hooters. 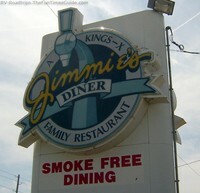 Jimmie’s is a 50’s diner, where all the waitresses wear poodle skirts and ponytails. 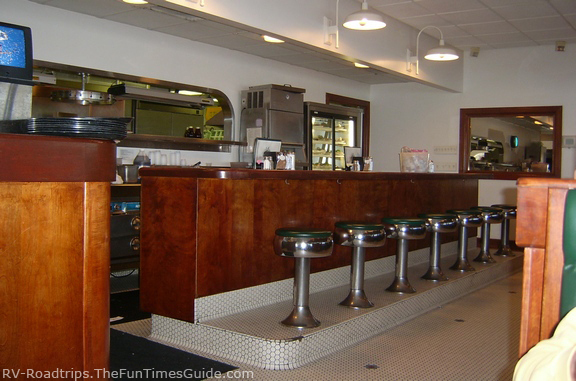 At Jimmie’s Diner there are tabletop jukeboxes where you can select from a good variety of 50’s music, such as “Leader of the Pack” and “Earth Angel”. When we got there, it was about 10 o’clock in the morning. There was already a pretty good crowd there, but we were seated right away. Our waitress, Kitten, brought our coffee and took our order right away, too. 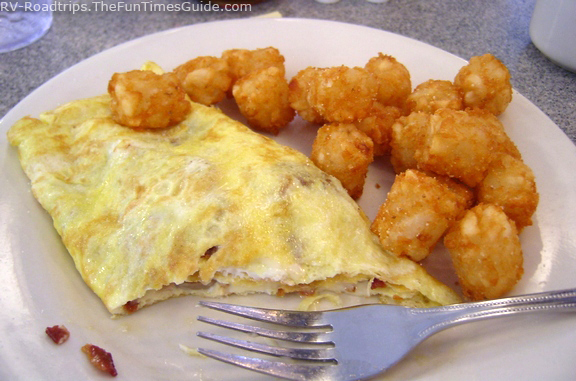 Jim ordered an Italian omelet, which had sausage, green onions, green peppers, mushrooms, and provolone cheese. It was covered with a red sauce. He chose hash browns and pancakes as his 2 sides. There was so much he was not able to eat it all, and he is a pretty big eater, believe me. I had the Alpine omelet with fried mush and potato gems. The fried mush was new to me, but it tasted like fried grits, and was pretty good. The potato gems were tater tots. The omelet had mushrooms, bacon and swiss cheese. Yum! Our breakfast for two, which was way more food than we should eat, with coffee came to $19.12. You can get breakfast all day at Jimmie’s, but the menu has a lot of other choices, too. Sandwich choices include burgers, chicken fried steak, pork cutlet and grilled reuben. Some of the dinner choices include Mom’s meatloaf, grilled liver and onions, grilled pork chops, and Polish sausage and kraut. One of the most popular things on the menu at Jimmie’s Diner is the old fashioned chocolate malt. I saw waitresses delivering them to other tables, and boy did they look good. They served them in the old fashioned malt shop glasses, with lots of whipped cream and a cherry on top. The metal mixer container with the extra malt that wouldn’t fit into the glass was served along with it. Mmmmmm.